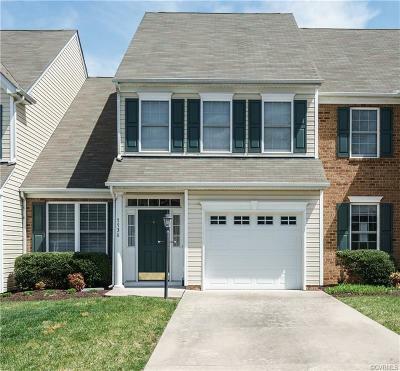 Like new and meticulously cared for, this townhome has a 1ST FLOOR MASTER and adjoining master bath! Enter into a lovely foyer with hardwoods floors. Walk into the spacious Dining Room also with hardwood floors and a chandelier, then head into the open kitchen boasting Cambria quartz countertops and stainless appliances- all which convey! The Family Room has a cathedral ceiling and opens to an additional Florida Room setting. The 1ST FLOOR MASTER has a double window and beautiful tile bath with walk-in shower, double sinks, and a walk-in closet.The laundry Room is also on the first floor- washer/dryer convey! Upstairs find another large bedroom with over sized closet. A full bath is upstairs and an open loft overlooking the 1st floor. Outside a patio overlooks the landscaped common area and tennis courts. A jogging path is available for the community. The 1 car garage as plenty of room for storage plus your car. The community has a designated parking area for RVs etc for residents use. Close to shopping,resturants, accessible to 295 and 95/64, it also is on the way down 360 to the Riva!